On Friday 10th November, the GIS hosted two talks that continued the strong interdisciplinary focus of the seminar in this term. First, Lucia Tamponi, a visiting student from Pisa, presented her research on an epigraphic corpus of inscriptions from the island of Sardinia, in a paper entitled ‘Sociolinguistic research on Latin inscriptions from Sardinia: building a corpus’. In particular, she explored whether the incidence of the misspellings in the inscriptions can be related to socio-linguistic factors or interference phenomena. In the second part of her paper, she presented an overview of various studies that have been conducted previously, though there is considerable dearth of analysis, since the majority of interest is focused on other Latin regions like Lazio, or Sicily. The bulk of the evidence that she had collected, presented, and analysed attempted to link the language of the inscriptions to the development of the Romance vowel system. Her project, which aims to form a complete and fine-grained annotated online corpus, will allow linguists to analyse spelling variants and to interpret them with reference to the provenance place (diatopic), the dating (diachronic) and the type of the text (diaphasic analysis). In the second part, she presented some suggestions on the development of the Sardinian vowel system through the analysis of this corpus. By attending to the spelling variations and the changing vowel quantity in the historical development of the Romance language, her talk showed how such a corpus, and its study, can help us gain a better understanding of the language in question. Questions that followed concentrated upon the different caveats such a corpus-centred study might entail, while also the benefits and pitfalls a comparative perspective (with other Romance languages) might give rise to. The second paper was given by Ben Kybett, on ‘Themistius’ Oration 5 and Religious Tolerance in the Fourth Century A.D’. This oration is conventionally held to form part of a ‘pagan last stand’, as traditional religion was pushed out by the rising tide of imperial Christianity. More recent scholarship has questioned such an analysis. Indeed, as Ben pointed out, it is much more difficult than usually thought, to take the oration at face value. 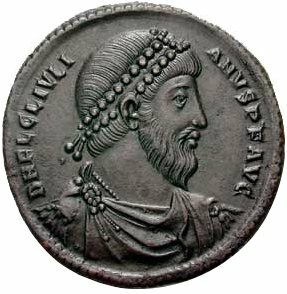 In his paper, Ben gave a short historical overview of the context in which the oration was delivered, namely the 1st of January 364, when the pagan orator Themistius rose before the Christian emperor Jovian to make an impassioned plea for religious tolerance. Noteworthy is also the second delivery of the oration, a few months later, which has been a problem for modern criticism. Recent attempts to explain the aim and function of Themistius’ oration, Ben argued, are all shown to be in some respect inadequate. In the paper’s second part, Ben suggested placing the speech in a much wider historical context and paying attention to the multifarious and diffuse religious sentiments that dominated the fourth century CE. Specifically, he argued for an understanding of religious beliefs, and, in particular, monotheism and polytheism, as two poles in a spectrum, rather as two mutually exclusive opposites. Religious tolerance would, so, be a plea to more things that unite different believers than separate them. Themistius, according to Ben’s argument, is finding common ground between Pagans and Christians, in a welcome proclamation of ‘good news’. Or, as he succinctly put it, ‘Themistius argues for pluralism, not univer salism’. The discussion that followed raised some fundamental questions about the role of religion and religious sentiments for the nascent ‘Byzantine Empire’, as well as for the larger historical narratives that have posited a significant rupture between earlier and later ideas of religious tolerance. The role of Julian, the so-called Apostate, and of his ‘revival’ of Paganism, was brought into question and pitted against the wider beliefs of (in)tolerance current in the Roman world.